Despite all the curated playlists, recommendations and radio stations we have at our fingertips, finding new music that we actually like – and are currently in the mood for – can sometimes feel like a chore. 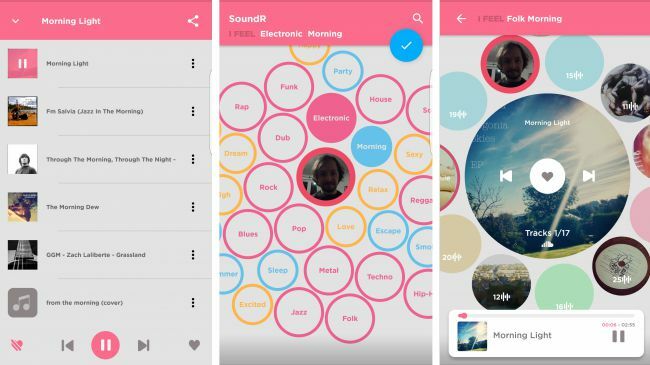 We won’t pretend that SoundR Musiccompletely solves the problem, but it does help, letting you choose a genre, followed by one or more moods or settings, such as ‘happy’ or ‘morning’. It’s this which really helps SoundR Music stand out, as most alternatives limit you to a single mood or other keyword. Once you’ve dug down into what you’re in the mood for, you’re then presented with a selection of playlists that the app reckons you’ll be into, and you can stream these free of charge, favoriting any you particularly like, so you can easily return to them later. Add in a colorful interface that’s more polished than you’d often find in such a new app, and the fact that it’s completely free with no adverts, and it’s easy to recommend.